Serenity is her middle name. Her simple, affectionate smile envelops strangers and friends alike. 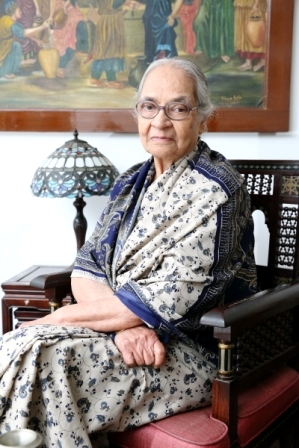 Mrs. Henrietta Colaco, aka Hetty, an 87-year-old Christian great-grandmother now residing in Bangalore, is mother of four, grandmother of six, and great-granny of five. We met up to chat about life, values, home-cooked meals and I asked her for her formula for happiness and a HEALTHY lifestyle. It is simple – enjoy whatever you do; you don’t need lofty goals to feel good, joy resides in just being in the moment, wherever and however you are. It’s a pleasure to meet you, Mrs. Colaco. Can we start with your childhood and education? I grew up in Mangalore in 1927 and was the eldest among eight children. We later moved to Chikmangulur where my parents had an estate. I completed my education in Chikmangulur. The norm in those days was arranged marriages. When I was in high school, a proposal had come for me. My parents visited the boy’s house, met his parents and the alliance was fixed. As simple as that. Once the engagement took place, he asked me out for a movie and I went with all my sisters. I told him clearly that I will not meet him alone before marriage (laughs). My husband’s family lived in Koppa coffee estate in Chikmangulur district. I continued to live there after my marriage. Did you know housework at that young age? I learnt quite easily. I have always been a housewife. In fact, most of my friends have been housewives. We did not have aspirations to take up a job. We were happy being at home. In fact, I do not ever remember being bored or discontent. My husband passed away when I was 49 years old. After all my daughters settled down and moved into their respective families, I did not want to stay all by myself. I came to Bangalore to stay with my eldest daughter Loveina and grandson Santosh, who is a pilot and married to Helen. Right now, with their two children aged 5 and 9, we are four generations living here in this flat. Once my children grew up, I travelled abroad frequently to visit family and during family weddings. It was something I enjoyed immensely. I travelled to USA once in my seventies and the next time in my eighties. Even now, I am ready to travel if an opportunity arises. What do you miss about earlier times? More than anything else, the habit of sharing. For instance, earlier we did not have a separate cot for each child even in affluent families. We simply spread mattresses on the floor and slept together. Nowadays, we believe that each child can have their own room. Also there were simple values such as offering a prayer before sleeping and as soon as we woke up. But all that has changed. The younger generation, and many from the older too, now check their mobiles and iPads even before they open their eyes fully. Television is a huge distraction in modern way of life and cannot compensate for the joy of simple games we played as children. Do you try to advise your grandchildren? I think it is better not to interfere in their decisions and remain silent. It is the only way to earn their respect. Life is different now and hence their outlook is bound to be different from ours. But honestly, everything apart, my family and children do take care of me extremely well. They pamper me. I wake up at 8 am everyday. I love cooking, so after I eat some breakfast, I cook lunch for the family. After that, I take some rest in the afternoons. In the evenings, I do some crochet and knitting. I read the newspaper regularly and like keeping track of news. I spend a lot of time with my great-grandchildren. In fact, whenever a baby is born in my family, I enjoy taking care of the mother and child for the first six months. Your family says you are very good with children. I think that is really true. I am very particular about how children should be brought up. Of course, that is now. When my own children were born, I was quite young and don’t know how I really managed. In fact, I would like to share with you that a magazine from Bangalore featured me in an article titled ‘Bringing up Children’. Your views on change in food habits across generations? I believe that we had greater discipline with regard to food earlier. There was a sense of order and timeliness. We did not fuss over what to eat and what to avoid since meals were cooked for the family instead of individual preferences. My own children and grandchildren ate in a healthy manner except the ones who grew up outside the country. But nowadays young children are poor eaters and give their mothers a lot of trouble over food. Occasionally, not as a way of life. To date, all of us like home-cooked meals. We hardly ever order food from outside. Have you always enjoyed cooking? Your grand-daughter-in-law Helen says that you spoil everyone with your tasty meals. Helen is quite an expert at identifying the perfect taste. She is always jotting down my recipes. When I was growing up, we always had cooks at home. My own love for cooking started only after my third daughter was born. If you have to name one dish which is a comfort food, what would it be? Kunjee, which is porridge I prepare with red rice. Even now, I only have kunjee at night with some pickle. In fact, I always laughingly state that kunjee is our birthright. Even if you are unwell, you can have it with pickle. It has the quality that it can satiate anyone. If I asked you for a wish list, what would it contain? That I had not lost my second daughter, Diana, to cancer. Surprisingly, she was a strict vegetarian from a young age. Sometimes I tried to force her to eat non-vegetarian food since it is our way of life, but she would throw up immediately. Her commitment to remaining vegetarian has remained a mystery for me. Thank you for sharing your thoughts. Its been a pleasure meeting you. First published in May 2014 in Harmony – the Indian magazine for silvers for the column – The Great Granny Diaries. Part-2 of this post is Mangalorean Pumpkin Curry from the kitchen of Henrietta Colaco. She is the 21st grandmother featured in this column.